America lifted its sanctions on Iran earlier in 2016, and you know what that means: Iran is the trendy new place to go. Well, not exactly, but it’s getting there. 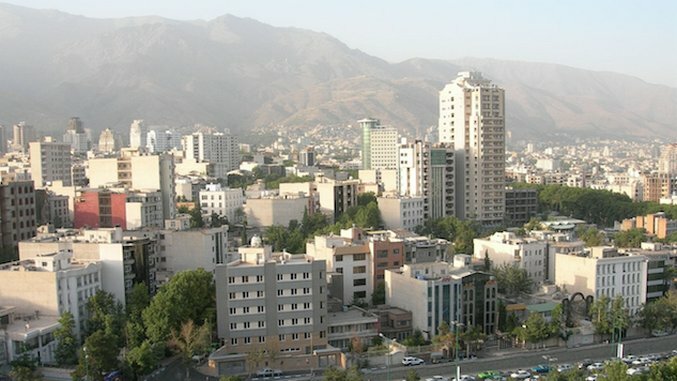 Tehran actually reminds us a lot of New York City; underneath all that concrete lays a liberal city. The only differences (OK, there are a lot of differences) are its age and rugged backdrop: the Alborz Mountains. Despite all its political madness, the Iranians are recognized by the United Nations as having created the world’s first charter on human rights. Not unlike Game of Thrones’ Mother of Dragons, when Cyrus the Great (the original King of Persia) conquered Babylon in 539 B.C., the first things he did were free its slaves, allow everyone to choose their own religion and establish racial equality. Cyrus’ ideas spread quickly throughout the world—first to India, then Greece and eventually Rome. Point being, no matter how crazy the country’s politicians might seem, Iranians are good eggs and it’s a culture definitely worth exploring. Our favorite time to visit Tehran is the fall. There’s a palpable crispness in the air; the heat and overbearing humidity of summer have passed, yet the dense pollution of the winter has not yet set in, making it the perfect time to wander the city streets popping in and out of art galleries and chic cafes. With so much to explore, visiting Iran’s capital might feel overwhelming, so here’s a list of spots no one should miss. Musé e Javaherat, or the Treasury of National Jewels, boasts the world’s most precious jewelry collection and is home to exquisite pieces including opulent crowns, bejeweled swords, golden thrones and even a bedazzled globe set entirely in precious stones (the ocean is made entirely of emeralds!). The most gawk-worthy gem is Darya i Nur (Sea of Light), a glorious uncut pink diamond weighing in at 182 carats, the largest in the world. Borj e Milad, the Milad Tower, at 1,427 feet, is the sixth tallest tower—and the 17th tallest freestanding structure—in the world. The tower houses a cultural center, an open observation deck, an art gallery, a sky dome and a revolving restaurant called Aftabgardan (translation: The Sun Garden). You can definitely find better food in Tehran, but the view is worth the visit. The Park of the People, or Park e Mellat, is Tehran’s version Central Park (although not geographically in the city’s center). Mellat Park is a refuge from such a bustling city—the perfect place to go for a walk, pack a picnic and loll around amongst nature on a Friday (Iranians only take Fridays off). The grounds include several species of wildlife, a lake, a playground, a cinema, and numerous restaurants and cafes. Tehran’s Pol e Tab’iat, or Nature Bridge, is an 886-foot bridge that connects Ab-o-Atash Park to Taleghani Park. The bridge is the largest pedestrian overpass in the area and has won numerous architectural awards including the Popular Choice Prize for highways and bridges from the Architizier A+ Awards, a global architecture competition based in New York. As soon as you step onto Tajrish Bazaar’s cobblestone pathway, it feels like you’ve been transported to another place and time. This market is one of the (if not the) oldest markets in Tehran. Located in the far north, the Tajrish Bazaar is home to a number of stalls and is divided into sections by type—housewares, produce, souvenirs, jewelry, etc. We recommend snagging a freshly baked loaf of sangak flat bread—warm and straight out of the oven—to nibble on as you browse the stalls. Note to jewelry connoisseurs: Tehran has high quality jewelry, especially the turquoise and gold they carry at this bazaar. Darband is our last stop on this list. Even if you aren’t up for the hike to Mount Tochal, don’t miss the magical, Old World charm of this windy, alley-like street, nestled in the hills. It’s lined with artists; craftsmen; and delicious, authentic Iranian restaurants. Before you leave, visit the old man with the beautiful canaries. Make a wish, and the bird of your choosing then plucks a poem from Haafez to reveal your fate. Neelou Malekpour is a Los Angeles-based freelance writer and blogger at The Viceless Vixen.